Back in August of 1989, when the Sega Genesis was released, its retail price was $189. Adjusted to inflation, a Genesis would cost about $380 if released today. But this isn’t 1989 anymore, and today, console clones can emulate the Genesis for between 5-10% of that price. Unfortunately, finding a great console clone is actually a little tougher than you might think. Emulating game hardware can be enormously difficult. In fact, the difficulty of emulating hardware is why you still won’t find any good PlayStation 3 emulators to this very day. Not even illegal pirated versions. Because there’s a complex relationship between how games are written and the physical hardware of a console. For any number of practical reasons, cloned Genesis consoles don’t use identical hardware to an old Genesis. As a result, they’re prone to producing a number of small issues related to compatibility. You may find specific games fail to load, controllers don’t show up as connected, or visual crashes occur. You might even find that old cheat codes don’t work properly because button inputs are slightly different. When developers are creating a clone of the Genesis console, compatibility issues are almost inevitable. Because like NES clones, Genesis clones aren’t made from the exactly same materials, in the exact same way. Instead, they’re constructed from modern technologies, which have to them be trained to perform similarly to the original Genesis. As a result, you might find that even the best Genesis clones on the market will still be unable to load certain games. Unfortunately, it can also be tough to predict precisely which games might be affected until you actually shove the game cartridge into the console and give it a try. When you find a great console clone, these types of issues will be few and far between. But not entirely gone. Some people are looking for a deeply authentic recreation of the Genesis. That includes all of its faults. And the Genesis had many, some of which are what allowed for certain cheat codes and game exploits to work. 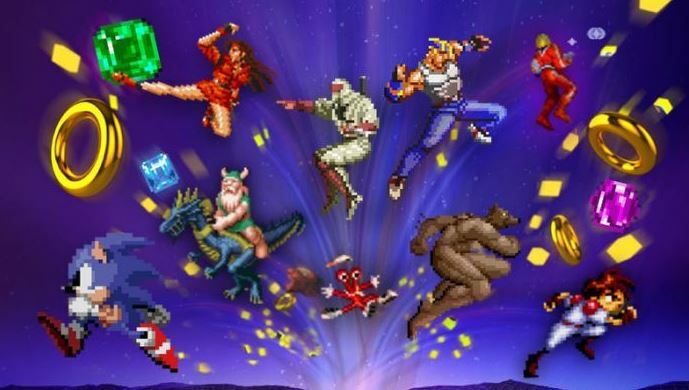 Other people just want to enjoy some nostalgia, and they don’t really care if their game is performing a little differently than it did decades ago. This is really a matter of taste, but it’s also something that can have a significant impact on price. When you’re looking for authenticity, you’ll want to look for classic A/V cables, and you’ll want to look for an aspect ratio switch. Though having a forced aspect ratio switch is not necessary if your display is capable of forcing the aspect ratio to the Genesis standard of 4:3. For people who care less about authenticity, basically every console clone these days will include an HDMI port for higher resolution output. With HDMI, your games won’t look at fuzzy as they did decades ago. Even for people who plan on using the A/V cables for their favorite games, it’s nice to have the option to switch over to an HDMI input when you’re playing games you care less about. Also, be sure to look into HDMI to AV converters if this simply isn’t an option for you. The type of controller you want also hinges on how you feel about authenticity. Because like most older controllers, the original Genesis controllers weren’t really that great. For people who are looking for the same mushy feedback as the original Genesis provided, it’s important to pay attention to those kind of details. For people who care less about highly accurate recreations of old game experiences, you can find Genesis controllers which are aesthetically the same, but have been constructed to a more modern standard. 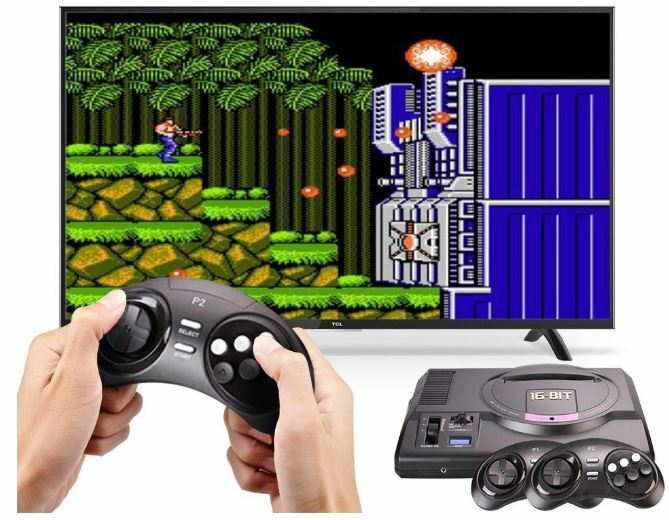 From a quick glance, the Minigen HD Video Entertainment System has a passing resemblance to an original Genesis console. If it had the Sega logo scrawled across its topside, it would be hard to tell them apart. The guts of this machine are much the same. 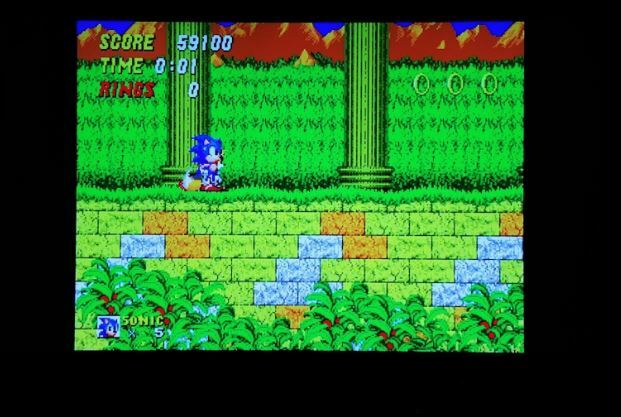 Though Minigen HD isn’t a perfect recreation of the Genesis, it certainly delivers an outstanding performance to dollar ratio compared to other clones. Similar to a Genesis 1, it measures roughly 9.5 x 9.5 x 2.2-inches. The build isn’t quite as distinctive looking as the 16-bit version of the Genesis, but it becomes far more obvious what console is being cloned once you get your hands on the controllers. Appearances aside, the Minigen HD was made to play Genesis Mega Drive games, and as such, it has that type of game port. Except instead of using ancient 480p resolutions or worse, the Minigen lets you carry over that signal into an upgraded HD video format. At least, if you’re looking for an updated experience. The Minigen HD includes a pair of controllers, one HDMI cable, and one Micro USB AC adapter for power. The only accessories that are really worth dwelling on are the controllers. Because here it’s worth noting the included controllers are annoyingly accurate compared to the classic Genesis Controller. There’s really only one significant difference. While the classic controller only had three buttons for your right thumb, the Minigen version of this controller includes six buttons. The extra row of buttons is slightly smaller, making them easier to identify as turbo buttons. These turbo button layouts were actually pretty popular replacements for the classic Genesis controllers, so this kind of alteration in design is easy to overlook, even for people looking to closely emulate their original Genesis experiences. Truthfully, faithful recreations are not always the best idea. The original Genesis controller had a mushy feel to its D-Pad. Turning to the Minigen controllers, you’ll find they feel almost exactly like the classic Genesis controllers. D-Pad feedback is just as miserable as it’s ever been. Whether you’ll like that kind of similarity depends on how accurate you want your emulation to be, but there are Genesis controllers out there built to modern standards, if it really bothers you. Gamerz Tek also includes a two-year warranty. Their tech support isn’t based in the United States, but their support doesn’t seem particularly worthy of scorn. Most people aren’t going to encounter some kind of serious issue that requires the assistance of support. Speaking of serious issues, before you think one of your games isn’t compatible or won’t work with the Minigen HD, it’s worth trying to clean off the game cartridge. Take some rubbing alcohol and pour it onto a cotton swab. Once it’s nice and damp, run the cotton swab along the connection terminals inside the cartridge. You’ll want to blow on the area after wiping it down with the swap to help the alcohol evaporate, and then give it a few moments to dry before trying to use the game again. This sounds a little silly, but dirt and debris can really get in the way of game cartridges getting read properly. Taking a couple minutes to clean up your games is always worth a shot. Aesthetically speaking, the GooDGo HD Game Console is clearly an imitation of the 16-bit version of the Genesis. Though this console is considerably more powerful than the classic 16-bit Genesis, it’s actually compatible with any Sega MD cartridge game. That’s thanks to a pretty effective dual decoding platform, though you can’t use Sega CDs or anything like that. The difference in power between this console and the classic Genesis largely comes down to its connections. Yes, this console lets you connect with UHD TVs with an HDMI port. But if you’re searching for a truly authentic recreation of the Genesis experience, it also lets you use classic analogue AV cables. Using the 16-bit format of the Genesis, the GooDGo HD Game Console is slightly elongated compared to the original version. The difference is only an inch or so, but that single inch really helps define the appearance of this console, and how easily it is to identify as a Genesis clone. This clone uses purple highlights, too. A nice touch towards making it look like the real thing. Similar to the 16-bit Genesis, the console itself actually has more to offer than a power button and reset button. You’ll also find a volume adjustment switch. A pretty old-school design that isn’t very useful today, but it’s nice that GooDGo took care in carefully recreating these kind of details. In any case, you never know if you’re going to end up playing a game that requires you to use that switch. So it really doesn’t hurt to have. In addition to the classic analogue AV inputs, there’s also an HDMI interface, and JP/US switch. That JP/US switch allows you to move between European and Japanese game cards. If you encounter an issue and your games aren’t loading, it’s one of the first things you’ll want to check. Because it’s unfortunately easy to switch between one mode and the other without noticing. Aside the AV inputs, you’ll find an aspect ratio switch. It can help you force the output to 4:3 or 16:9. If you’re using a television that cannot force 4:3 aspect ratio, being able to do that on the console is incredibly important for maintaining the visual authenticity of the games. If you don’t care that much about authenticity, then you’ll probably want to tape the switch into the 16:9 position. 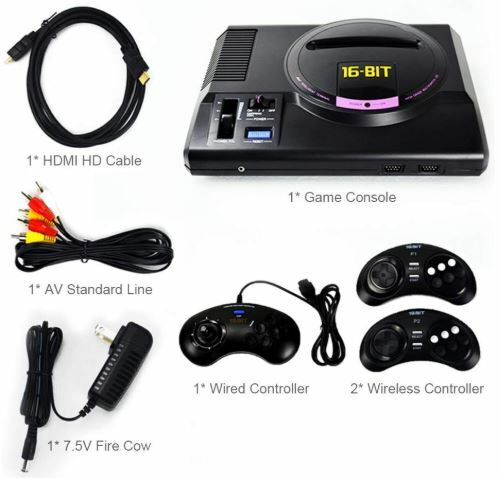 The GooDGo HD Game Console includes one pair of standard analogue AV cables, an HDMI cable, and a 7.5V power adapter. The wireless controller latency is pretty fantastic, and unless you’re a Genesis purist, it doesn’t really ruin the authenticity of your experience. 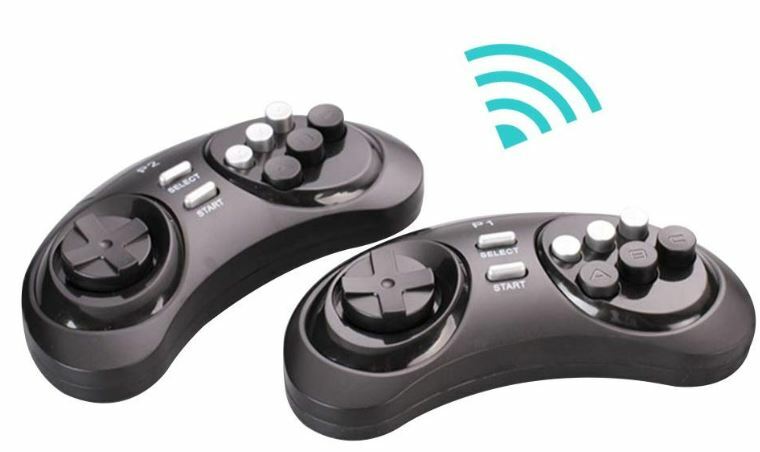 The GooDGo HD Game Console also includes two wireless controllers and one wired controller. The wired controller uses a joystick in the place of a D-Pad, while all three controllers include turbo buttons. There are actually two standard controller sockets, if you happen to want to use another wired controller, perhaps one you already own. The wireless controller with an effective distance of about 30-feet. Though these controllers perform better than original Genesis controllers, that’s exactly what some people are looking to find. GooDGo includes a lifetime product warranty. Though once again, it’s pretty unlikely you’re going to encounter issues with the hardware. It’s terribly easy to test consoles before they’re shipped. The Gamerz Tek Minigen HD is a passable Genesis clone with an excellent price. Whether you’re looking for an accurate recreation of the old Genesis experience, or you want to improve upon it with HD, this console provides you plenty of options. Its controllers are a great recreation of the original controllers, even though that means they do feel a little sluggish. 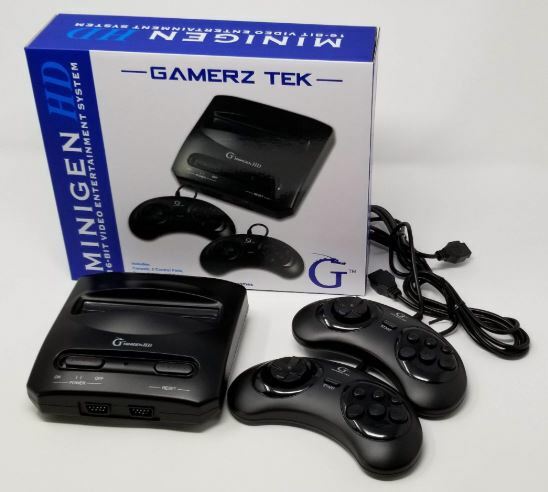 If you’re a casual gamer and you just want to goof around with some old Genesis games that you have laying around, then the GamerZ Tek Minigen HD is going to be perfect for you. 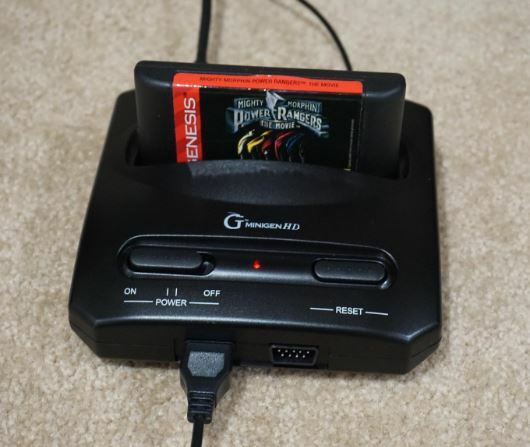 It doesn’t recreate every detail of the Genesis experience perfectly, but it’s capable of playing Genesis games while generally feeling like a Genesis console. 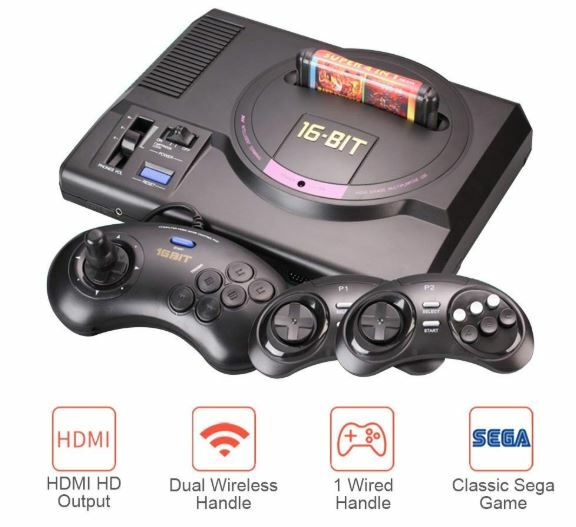 Experientially speaking, the GooDGo HD Game Console was made to be a faithful recreation of the 16-Bit Mega Drive Genesis. 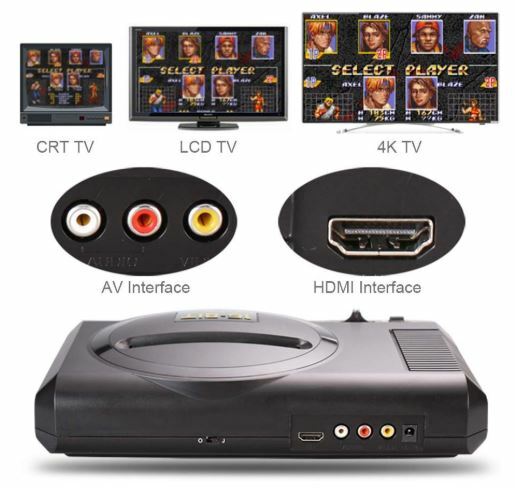 Though it does let you connect through HDMI, being able to connect with classic AV cables is essential to a totally perfect recreation of the Genesis, and so it provides them as well. The only thing that’s not totally authentic about this recreation is the wireless controllers. If that really bothers you, then you can use the controller port on the console, at which point the only thing to complain about is the fact you’re only getting a single wired controller. All in all, GooDGo’s clone is arguably the best Genesis clone on the market. It goes out of its way to facilitate an accurate recreation, while still being approachable to people who want to use modern wireless connections and HDMI connections.